How did that 87 percent find their agent? Less than a quarter of them interviewed two agents or more, while the vast majority went with the first agent they talked to. 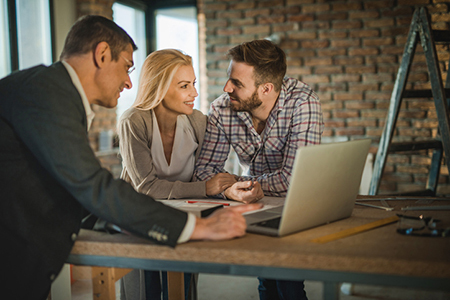 It may not surprise you that referrals from family and friends accounted for just over 40 percent of connections between buyers and agents, while 13 percent found their agent from websites, and 12 percent came back to an agent they’d worked with before. The rest chose agents in a variety of ways, including those they’d met at open houses or whose names they saw on local ‘for sale’ signs. What matters most to buyers, the report shows, - far more than job experience - is market knowledge. According to 91 percent of buyers, they are likely to choose an agent who impresses them with broad, current knowledge of what’s going on in their market - and half of them said an agent who stayed in touch and made them feel comfortable throughout the transaction was likely to win referrals as well as repeat business. Sellers, too, are likely to work with agents, with 90 percent listing their homes on the MLS and 75 percent of those interviewed saying they spoke with only one agent before listing - although, here again, 39 percent reported they chose that agent from a referral. So how can you increase your chances of being the agent referred? Honesty and trustworthiness were once again high up on buyer and seller want lists, noted the 2018 Profile, as were attitude, integrity, listening and paying attention. Word gets around when you are good at what you do, so even if you are relatively new to real estate, or have yet to build a hefty database, reach out often to everyone in your sphere of influence with market news, birthday greetings, and other reminders that can help keep you top of mind. Whatever you do, fulfill the promises you make.